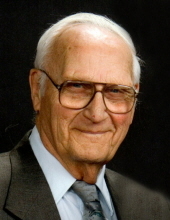 Robert P. Lolling, 87, passed away on Wednesday, December 13, 2017, at his home in Lincoln, IL. Robert was born on September 13, 1930, in Hartsburg, IL the son of Gratus and Marie (Swartz) Lolling. He married Jean Elenore Huskins on October 2, 1950, in Lincoln, IL. She preceded him in death on July 31, 2016. Surviving Robert are his children: Kenneth “Mike”Lolling of Embarras, MN, David Paul Lolling of Lincoln, IL, Deborah Sue (Tony) Meyer of Lincoln, IL, and Shari Diane (Donnie) Boyd of Metropolis, IL; Eight grandchildren: Tanya Lolling Adams, Mark Kazakaitis, Kristi Kazakaitis Carter, Sabra Boyd (Dagan) Brucker, Mollie Lolling (Matt) Murphy, Jeannie (Daniel Maxey) Lolling, Zachary Lolling, Hannah Lolling. Three great-grandchildren: Shane Adams, Jamison Carter and Addison Brucker. One great-great-grandchild: Asher Scott. Sister-In-Law, Pat Lolling; and one Brother-In-Law, Kenneth Huskins; several nieces and nephews. He was preceded in death by his parents, his wife, two brothers, Walt and Donald Lolling; and two sisters, Gretchen Knowles and Minnie Buss Bates. Robert was a member of Faith Lutheran Church in Lincoln. He worked as a storage control manager at Caterpillar for 37 years. Robert also worked in housekeeping at Abraham Lincoln Memorial Hospital. Robert adored his family and enjoyed spending a lot of time with them. Services for Robert will be held at 10:00 A.M. on Monday, December 18, 2017, at Faith Lutheran Church in Lincoln, IL with Rev. Mark Peters officiating. Visitation will take place from 2:00 - 4:00 P.M. on Sunday, December 17, 2017, at Fricke-Calvert-Schrader Funeral Home in Lincoln. Burial at Zion Cemetery will follow the service. Memorials may be made in Robert’s name to Faith Lutheran Church or Alzheimer’s Association.